Without oil, what would you do? How would you travel? How would you eat? What would everyday life be like? The world is about to change dramatically and permenantly as a result of oil depletion. Within the next few years, the global production of oil will peak. Thereafter, even with a switch to alternative energy sources, industrial societies will have less energy available to do all the things essential to their survival. We are entering a new era as different from the industrial one as the latter was from mediaeval times. A riveting wake-up call that does for oil depletion what Rachel Carson's Silent Spring did for the issue of chemical pollution - i.e. 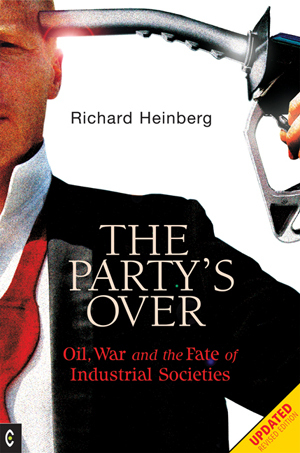 raising to consciousness a previously ignored global problem of immense proportions - The Party's Over is essential reading for all those concerned with the future of modern life as we know it. RICHARD HEINBERG is a journalist, educator, lecturer, and musician. He has lectured widely, appearing on national radio and television in various countries, and is the author of four previous books, including Cloning the Buddha, The Moral Impact of Biotechnology and A New Covenant with Nature: Notes on the End of Civilisation and the Renewal of Culture. The latter was a recipient of the "Books to Live By" award of Body/Mind/Spirit magazine.